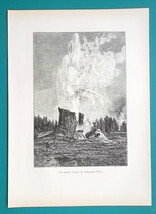 Print Specifics: Type of print: Wood engraving or Xylograph - Original antique print Year of printing: not indicated in the print - actual: 1883 Publisher: F. von Hellwald, Leipzig, Heinrich Schmid Carl Gunther Condition: 1 (1. Excellent - 2. Very good - 3. Good - 4. Fair) Light age toning of paper, slightly darker along the edges. Dimensions: 9.5 x 13 inches (24 x 33 cm), including blank margins (borders) around the image. Paper weight: 3 (1. Thick - 2. Heavier - 3. Medium heavy - 4. Slightly heavier - 5. Thin) Reverse side: Blank Notes: Green color around the print in the photo is a contrasting background on which the print was photographed. Photos show the overall view of print and image detail. Slight distortion of the shape of print in the photo is caused by the camera. Narrative: The crater of this geyser is three fret by ten. The opposite Sentinel is not so constantly active, and is smaller. The rapids here are two hundred yards in length, with a fall of thirty feet. Following the bank of the river, whose general course is from the southeast, though with many windings, two hundred and fifty yards from the gate we reach three geysers acting in concert. When in full action, the display from' these is very fine. The waters spread out in the shape of a fan, in consequence of which they have been named the Fan Geysers. A plateau, opposite the latter, contains fifteen hot springs, of various characteristics; some are of a deep-blue color, from sulphate of copper held in solution, and having fanciful caverns distinctly visible below the surface of the water. The openings at the surface are often beautifully edged with delicately-wrought fringes of scalloped rock. One variety deposits a red or brown leathery substance, partially adhering to the sides and bottom of the cavern, and waving to and fro in the water like plants. The size of these springs varies from five to forty feet in diameter. 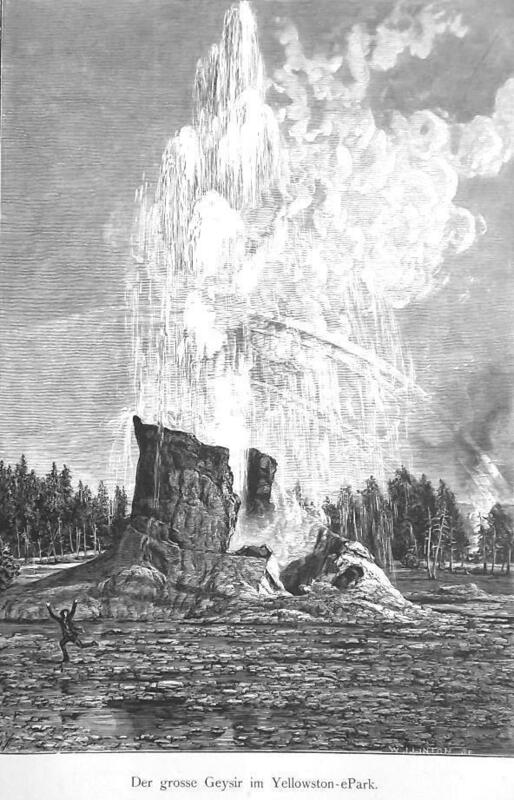 One hundred yards farther up the east side of the stream is found a double geyser, a stream from one of its orifices playing to the height of eighty or ninety feet, emitting large volumes of steam. From the formation of its crater it was named the Well Geyser Above is a pine-swamp of cold water, opposite which, and just above the plateau previously mentioned, are found some of the most interesting and beautiful geysers of the whole basin. Martin2001 Satisfaction Guaranteed Policy! Any print purchased from me may be returned for any (or no) reason for a full refund including all postage. seller since 1998. Five-star service.